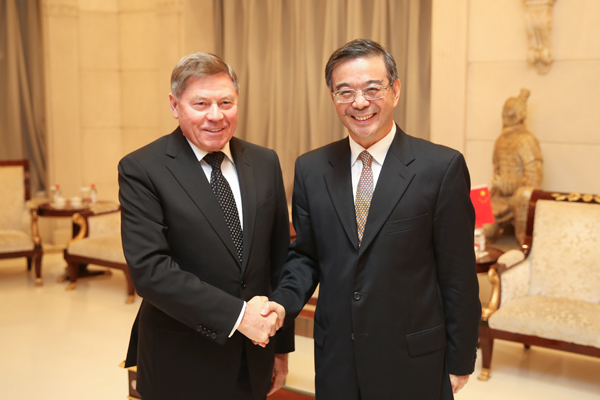 Zhou Qiang, president and chief justice of the Supreme People's Court of China (SPC), met in Beijing on Oct 29 with Vyacheslav Lebedev, the Chief Justice of the Supreme Court of the Russian Federation, and expressed his desire for more judicial cooperation between China and Russia. At the meeting, Zhou outlined the development of China's legal system and judicial reform and affirmed the increasing cooperation in judicial matters between the two nations. China’s SPC looks forward to working together to offer better judicial services to people in both countries under the framework of the Shanghai Cooperation Organization (SCO) and the BRICS, Zhou added. Lebedev spoke highly of China's judicial reform achievements and shared the current development of judicial reform in Russia. He also showed his willingness to see a deeper China-Russia judicial relationship. Also present at the meeting was Yang Wanming, vice-president of the SPC and Grand Justice of the Second Rank.